The Florida black bear (Ursus americanus floridanus), a subspecies of the American black bear, is found in heavily wooded terrain, particularly hardwood swamp, cypress swamp, and undisturbed upland forest. The majority of Florida is far too developed to support bear populations; however, there are populations in several areas of the state. Here, in Hernando County, we are lucky enough to have a very small population in the Chassahowtizka National Wildife Refuge which we share with Citrus County. There are also Florida black bear populations in Eglin Air Force Base, Apalachicola National Forest, Osceola National Forest, Ocala National Forest, St. Johns River Basin, Highlands Hammock State Park, and Big Cypress National Preserve. Florida black bears do not hibernate, but rather go into a semi-hibernation state known as torpor. In Florida they may do so only during extremely severe winter weather. Torpor tends to be more common in females who den when they are producing cubs. The female may stay in her den for a few months. A den may be made in a variety of situations, including logs, stumps, tree cavities, caves, banks & culverts. Black bears climb well, and some dens may be well above ground level. Many times a temporary nest, or bed, is made on the ground for resting or napping. The nest is generally a depression found in a palmetto thicket, or tangle of vines, lined with pine straw and leaves. Black bears feed throughout the day and night; however, they are most active during the night and early morning hours. They are omnivorous. Plant material makes up 80% of their diet, which consists of acorns, berries, fruits, palmetto berries, grass, honey, seeds, nuts, buds, roots, tubers, the inner bark of twigs, hearts of palm, insects, grubs, lizards, snakes, frogs, fish, rodents, armadillos, bird eggs, wild hog, deer, and carrion. When they are foraging they usually destroy the tree stump or log to get at the insects inside and will totally destroy cabbage palms and palmettos in order to get at the tender hearts. Females are able to reproduce at three years of age, and generally do so by the time they are 4 years old. Females breed in alternate years during June & July. The female’s embryos undergo delayed implantation for 5-6 months. The embryos are implanted in the uterus in mid-winter, and gestation lasts from 6-8 weeks. Twins and occasionally triplets are born in January or February. The cubs are born hairless, blind, and weighing only 6-8 ounces. At about 40 days old their eyes open, they are well furred, their first teeth appear, and they weigh about 2 pounds. Cubs do not leave the den until about two months of age, and continue to nurse from their mother throughout the summer, and fall. By the time they leave their mother, during the second year, they weigh about 100 pounds. Adult females weigh 90 to 300 pounds, and males weigh 125 to 500 pounds or more. A Florida black bear’s life span is generally 15-20 years in the wild and 25-30 years in captivity. Age is determined by the amount of tooth wear, or the number of growth rings in the roots of canine teeth, or premolars. The growth ring method is only accomplished by the removal of a tooth once a bear has been caught in a snare trap and the biologists have a go at it. In Florida, black bear ranges extend up to 100 square miles. Adult males generally range farther than females. They have been known to wander as far as 300 miles within a few days. Young bears must eventually move out of their adult’s territory in search of their own and in doing so may range farther than an established animal. 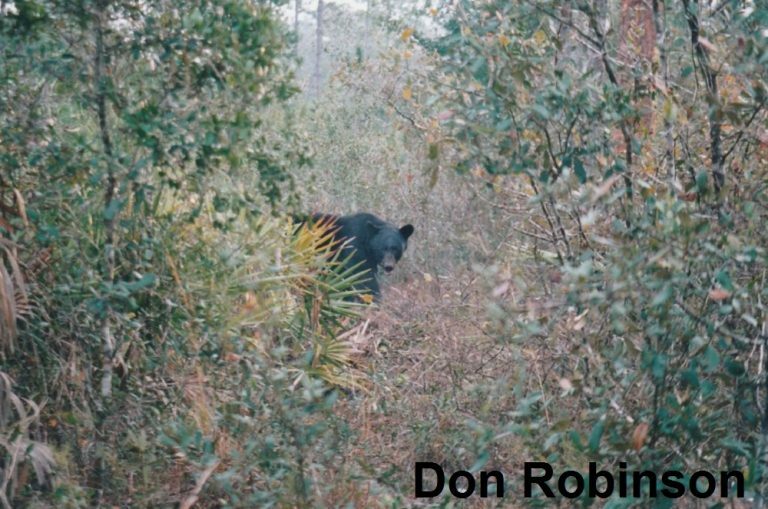 In the early 1900’s the number of black bears in Florida numbered roughly 11,000, in the 1940’s it dropped to somewhere between 300 – 500, in 1998 there were between 500 – 1000, and in 2012 there were more than 3,000. Conservation efforts have improved their numbers. Consequently, the Florida Fish and Wildlife Conservation Commission removed them from the threatened species list in 2012, and reduced the illegal hunting of a black bear from a felony to a misdemeanor. Hunting Florida black bears was banned in 1994, but who knows what the future holds on that issue … there are many people in favor of reopening bear hunting. There has never been a reported case of a black bear making a predatory attack on a human in Florida. According to the Florida Fish and Wildlife Conservation Commission’s website there have been reports of people being bitten and scratched by bears while defending themselves, their cubs, or food sources. The Florida black bear’s hearing and sense of smell is so acute that they usually retreat before people are even aware that they are there. With the increased population of bears, and humans, there will be far more encounters between the two. Bears will easily get accustomed to eating pet food and garbage if it is left out, and will make a nuisance of themselves. If you live in bear country keep pet food and garbage put away. Do not feed black bears. It may seem like a good idea, but acclimating them to human contact will only cause them to become nuisance bears which in turn usually ends in death for that particular bear because it will lose its fear of humans. A fed bear is a dead bear. If you want to help the bear the best plan of action is to scare it away. Sustaining a fear of humans will keep it alive. Electric fencing is 99% successful for deterring bears. The University of Florida’s Institute of Food and Agricultural Sciences has a helpful article – Living with the Florida Black Bear: a Homeowner’s Guide to Nuisance Bear Prevention and the Florida Fish and Wildlife Conservation Commission’s website has a Living with Bears article. In my opinion the greatest threat to Florida black bears appears to be motor vehicle deaths. The human ‘suitable habitats’ placed upon them have no meaning to the bear’s instincts and they will continue to roam outside of these ‘suitable habitats’ in search of food and territory. The Florida black bear is an ‘umbrella’ or ‘key’ species and saving bear habitat not only protects bear habitat, but habitat for many, many, other Florida animals.